Over the next few weeks as we bust our humps packing up this house and preparing to move, I wanted to give y’all some glimpses into the new house so you can help me dream and plan for future DIY projects. Pinterest is, of course, my main source of inspiration these days, so I’ve been pinning ideas way more lately than normal. If you want to follow my pins to see where my thought process is going, feel free to join me over there and give opinions. So, welcome! 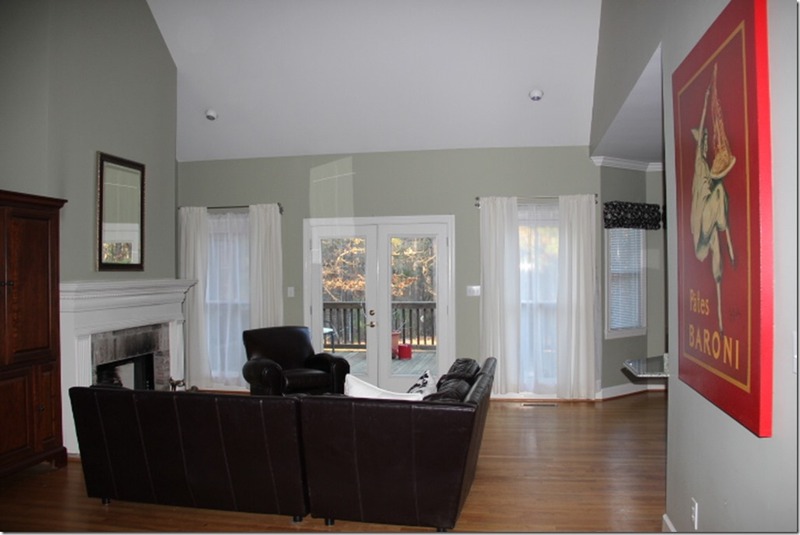 Here is the living room in the new house with the owner’s stuff in it. I snapped these quickly when we were touring the house, so there are many better angles to come in the future. One of the things I’m most excited to makeover is this tall fireplace that goes all the way up to the vaulted ceilings! 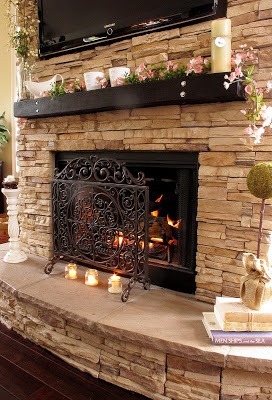 This stacked rock fireplace o’ perfections belongs to Kristin at My Uncommon Slice of Suburbia. Since I’ve coveted this fireplace for so many years, I figure it’s high time to make plans for a rock fireplace of my own in the new house. 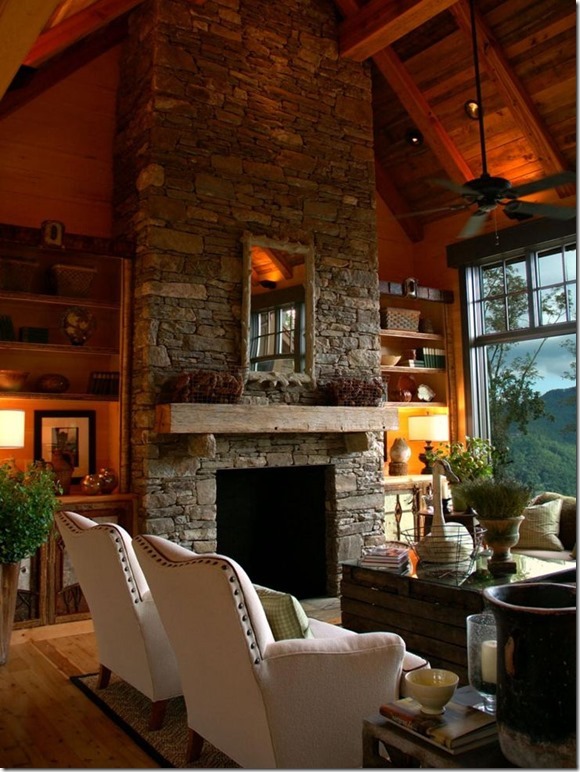 My most favorite HGTV Dream Home in Lake Lure, NC featured a rock fireplace/ vaulted ceiling combo that I’ve drooled over for years. This is one of those photos that Pinterest has to alert me over and over that I’ve already repinned it to multiple boards because I just love it so much. Hey, I can’t help it if I want to pin it to every board repeatedly, Pinterest police. And then there’s the question of what to do with the walls behind and beside the fireplace, which brings me to this inspiration photo. The charm of those built-in bookcases combined with the rock? I would do a lighter paint colors than those, but will that rock eventually get too heavy? Too dark? Too dated? I don’t know. Oh man. 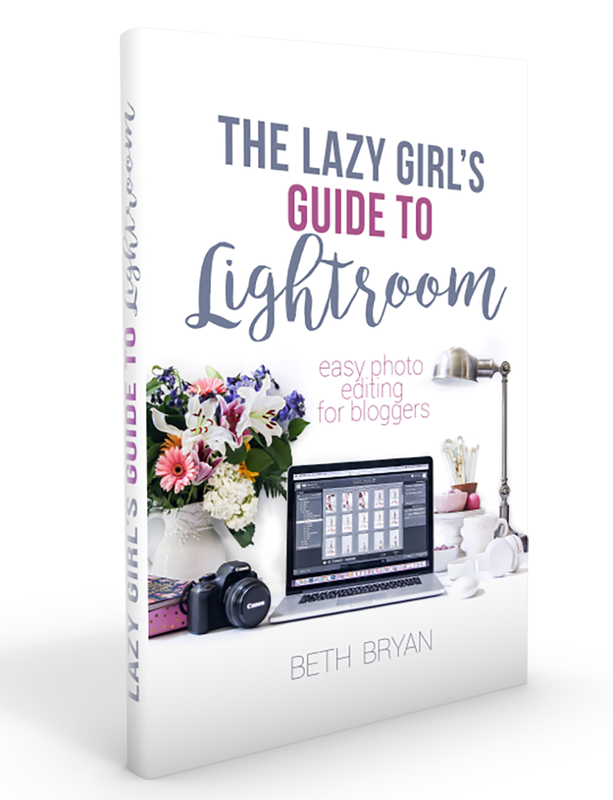 So many inspiration photos, so little time and money to make them all a reality. So, what would you do? Rustic and rocky or clean and crispy? It is going to be a tough decision, but it’s one that keeps me up at night when I wake up to go to the potty and can’t go back to sleep for all the planning, dreaming and scheming about the new house that is floating around my head. And that’s pretty often with this pregnant belly getting bigger by the day. I hate to say this, but I think the white shiplap will be the one that looks dated. I love it, but it IS a trend, + they have a way of going out of style. The stone is more timeless. Is there brick or stone on the exterior of your home? Wouldn’t a house feature the same fireplace material as used in the rest of the house? Or not. Good luck + happy planning! Oh man, I can’t to see what you do in this new house! I surely can’t help you with the decision, as there are too many awesome choices, but I will say one thing. If you’ve loved the stone forever, I’d say go for it. Are you going to be tackling that while preggo? Hmmm…maybe you better, because from my experience, one’s like none, two’s like ten! You’ve pinned many of the same ones I’ve pinned for the same reasons – what to do next to our fireplace. I was thinking white, but my husband has a dark side to him and on the opposite wall a furniture unit was just this weekend stained espresso. So I guess that means I better be thinking dark. You can’t go wrong with any of the looks you have pinned. I disagree with Kay – sorry, Kay! I think the shiplap look has been around for ages and ages. It’s the style that endures. Look at the design of todays homes: brick and stone, brick and stone. I believe that look will age like the cedar siding, stucco, and ‘5 4 and a door’ styles have aged. Throughout all those years, a simple white siding, black shutters house has endured. My theory is proven in most 20 year old neighborhoods – the only house that still looks relatively current (and doesn’t make your eyes hurt) are the ws/bs houses. While stone has stayed popular in mountain cabin areas, I’m afraid it will become tied in with the brick/stone look and will become dated in the next 10 years or so. I also agree with your dark/heavy concerns. So for me it’s shiplap all the way. 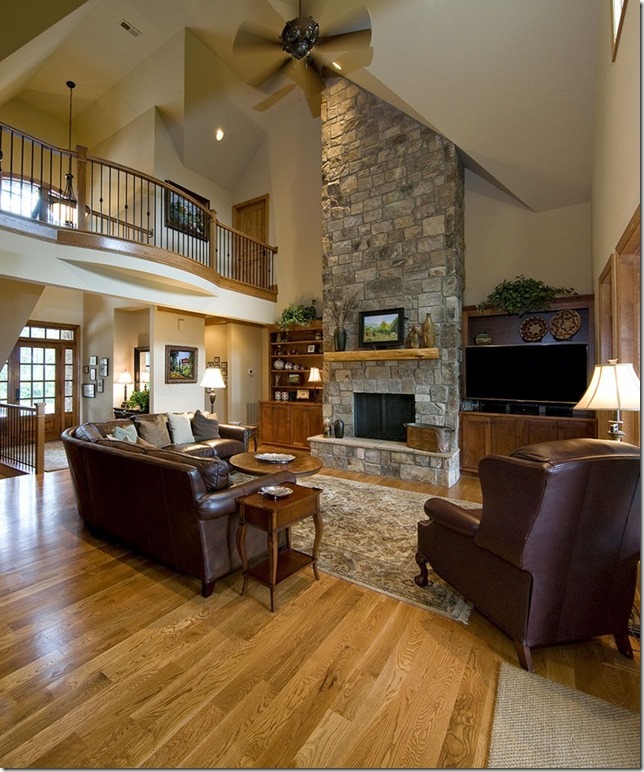 If you do decide on the stone, I think it would look best to carry the mountain cabin look through out all your living areas. But in the end it’s your home – whatever YOU like best is the right choice. I just moved into a new home with a full stone wall fireplace. I wait with anticipation to see what you decide to do. Love the inspiration pics! Oh I love all of your rock inspiration pics. Gorgeous. I am in love with every single fireplace you showed! Having said that – the stone ones are my first choice. In fact, when we rip out our carpeting and add hardwood floors in our family room, we are also updating the fireplace to stone. I haven’t decided which one yet though. I think it’s a classic look and I can’t wait to see what you do! You are so sweet to include me with your inspiration. I know it is going to be beautiful whatever you decide! Can’t wait to see more pictures of the house!! How exciting! 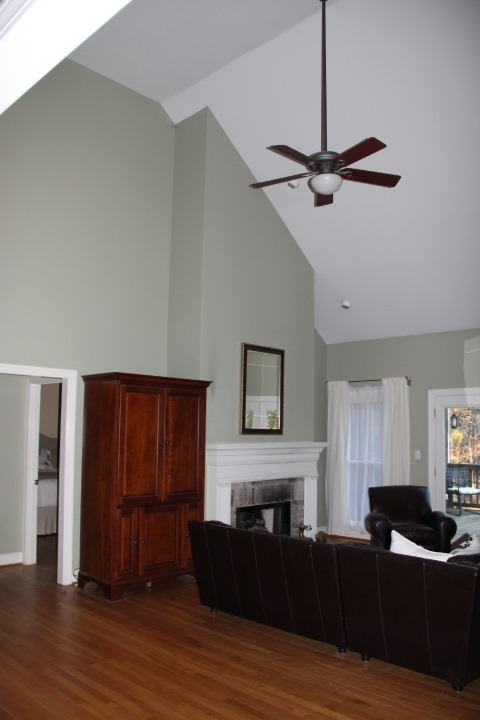 I have both the white (in the sunroom), and a river rock fireplace (in the basement). I love them both. I think my mantra is just to do what I like, but be willing to change it eventually. The river rock can be painted white, if I get tired of it, and the white can be changed with color, or faced with something later on. Either way, you should do what you love. 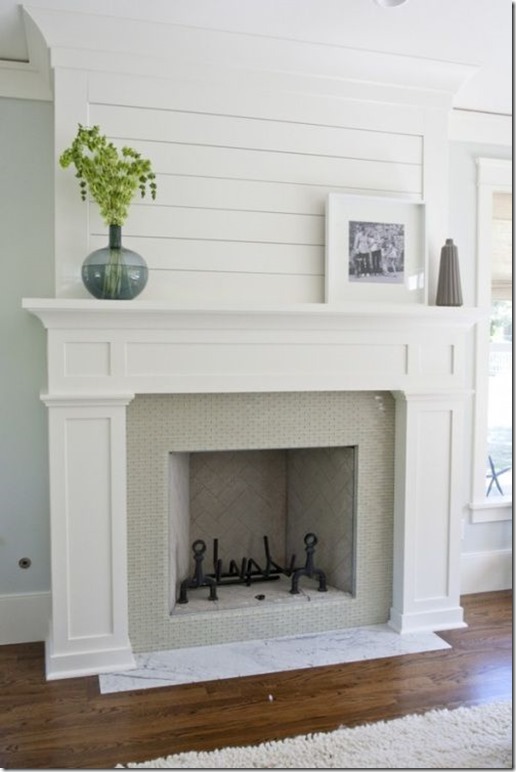 Love the rock – I’ve gotten hooked on an HGTV show “Fixer Upper” and they had a fireplace they recovered with rock (in the last few weeks, but will be rerun for sure) and it was stunning. The designer (wife) on the show mixes shiplap with stone too. That look is stunning too. I will say, the peek of your view is quite, quite nice too. If it is a great view, bringing rock in will just help pull all of that together. I do like the bookcases next to the fireplace, but not sure if I would want built-ins, or to have someone (maybe your hubby), put some together that look like built-ins, but that could be dismantled if you grew tired of them. Love the rock and love the white too. If you’ve been dreaming of the rock forever I says go with your heart. Love the inspiration pictures! 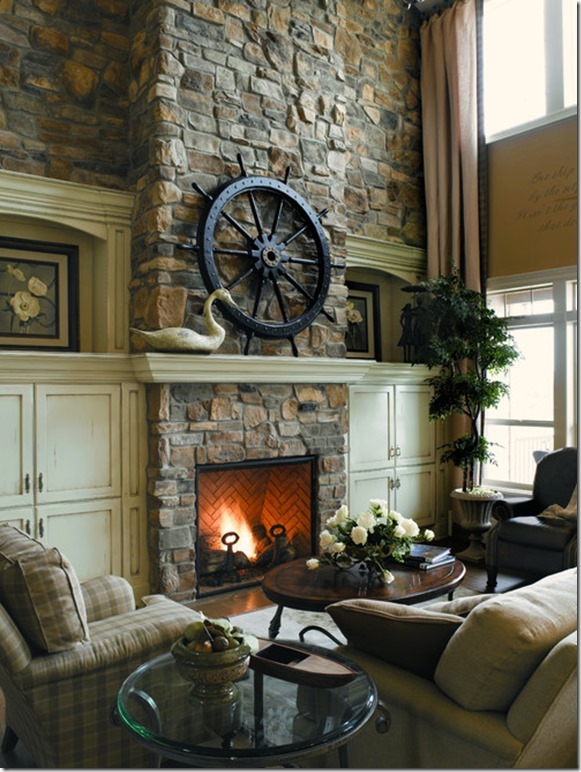 I would have to say Rustic and Rocky….The stacked rock fireplace reminds me of what we have in our living room now and I LOVE IT! !